I’ve got a lot of complaints about Trump, but the Syrian air strike is one that I consider an outright success. It was done in close cooperation of our allies. By all reports, the objectives were military targets, directly tied to chemical weapons production or research. The Assad regime promised to destroy all their chemical weapons, but obviously they lied. Russia still backs Assad. Military solutions are the last resort, but that’s exactly where we were with Assad. I listen to the discussion at the UN, and was very proud of Nikki Haley, as she forcefully defended our actions, along with the French and British ambassadors to the UN. General Mattis was equally impressive. I won’t go into the longer term strategy for now. Let’s give credit where credit is well deserved on the tactical decision and execution. James Comey is 57 years old, and I’m certain that he thought his appointment as Director of the FBI would be his last governmental job. His book, A Higher Loyalty, is scheduled to be published on April 17, 2018, and I’ve already ordered a copy. Most people like Trump are responding to short excerpts which have been posted to the Internet. I shall not enter the fray. No mosh pits for me, thank you. James Comey has served four Presidents: Clinton, Bush, Obama and Trump in leadership positions. His career has been a steady series of promotions. His career has been mostly in governmental positions, although he did work in private practice. After graduating from the University of Chicago, with a law degree, he worked as a law clerk for United States District Judge John M. Walker Jr. in Manhattan. He joined the Attorneys Office of the US Southern District Court of New York in 1987. As a side note, the head of the Southern District Court, Attorney Geoffrey Berman is now considered disloyal (among other things) to Trump after approving the search warrant on Cohen. Berman was appointed by Trump in January 2018. The links below, provides more details on the accomplishments of James Comey, generally working for the District Courts, the Department of Justice and ultimately the Director of the FBI, as appointed by Obama and confirmed by the Senate in 2013. He was confirmed by the Senate by a vote of 93 to 1. Rand Paul was the lone dissenter, concerned about drone surveillance. I think the CNN summary of “Who is James Comey” is very interesting and worth reading. I can see why Republicans might like him, as he was part of the Whitewater investigation, determining if the Clinton’s broke the law in their Arkansas real estate investigation. I’ve already covered extensively Comey’s investigation of Clinton’s email server. I concluded his actions were appropriate for a truly unique situation, given absolute time constraints, being the US elections and the highly contentious statements by Trump at political rallies. Comey has explained his actions, which have at times either upset Republicans or Democrats (never both at the same time), as he twice opened and closed the email investigation. Being non-partisan leaves you open to partisan attacks from both sides. As far as a leaker of information, this did occur, but what was leaked was Comey’s notes of a meeting he had with President Trump. It was part of his testimony to Congress, and I’ve included a link on this matter. My comments are generally under FBI as a category and James Comey as a tag. What I think irritated Donald Trump the most, was that Comey was a dogged prosecutor and non-partisan in all his activities. “A Higher Loyalty” seems a fitting title. As far as being a liar, Trump really is the last person to call anyone a liar. So far, politifact.com shows he tells the truth about 5% of the time. Not out yet. I plan not to buy any more books from Amazon. I will go to my local bookstore, buy a book, and read it while having a cup of coffee. I might be there all day so I’ll have lunch there too. It’s already on the best sellers list and not a copy has been sent to the public. Note: I hate all the ads that come with these links. It is very common knowledge that the FBI raided Michael Cohen’s office to seize information relevant to the Karen McDougal and Stormy Daniel’s cases. Michael Cohen is Trump’s personal lawyer. Two days after FBI agents raided his home and office—reportedly seeking documents related to hush payments made to women with whom President Trump allegedly had an affair, among other information—the president’s personal lawyer Michael Cohen had this to say: “I just want my stuff back.” That comment, made to ABC News, was Cohen’s first remark since telling CNN on Tuesday that the raiding federal agents were “extremely professional, courteous and respectful,” contradicting the president’s claim that agents “broke into” his lawyer’s office. I stated before that it seemed everything was done by the book. The Deputy Attorney General, Rod Rosenstein, signed off on the search warrant. He is a Trump appointee. There were multiple checks on this search warrant. Michael Cohen is under investigation for bank fraud, wire fraud and campaign finance contributions. The items seized from Michael Cohen are with the “taint team” to determine if what information is relevant under the scope of the search. It is another safeguard to protect the rights of Michael Cohen, against unreasonable searches. Alan Dershowitz, the very well known defense attorney and former Harvard professor, doesn’t see it this way. He obviously doesn’t believe there are enough checks in the system, to allow a search and still protect the legitimate privacy of an attorney’s records outside of what is criminal evidence. An article appearing in The Hill, is provided in the links. He has appeared on Fox News network, with the same opinion. Others, particularly on CNN and MSNBC, have voiced far more confidence in the judicial system and believe prosecutors will respect the rights of Mr. Cohen. I am particularly concerned, when Alan Dershowitz states that FBI raids should be limited to only “major crimes” which he then states this isn’t one of them. What will remain in the hands of judges, is the evidence that was used to support the search warrant, so Dershowitz, like the rest of us, is completely in the dark. We have First Amendment rights of free speech. This is the protection for individuals, who espouse very unpopular opinions including radicals on the far right and left of the political spectrum. It protects gay rights activist and atheist organizations. When high powered attorneys seek to intimidate people to give up their rights in exchange for money, I think this is worthy of an investigation. It is particularly egregious if the Daniel’s contract was invalid and payments were violations of campaign finance laws. The Supreme Court allows massive donations to be given to political parties, to monopolize the air waves during campaigns. The courts can not condone campaign violations which also silence dissent during a campaign. To ignore potential violations of law helps create new rights for the wealthy and powerful class, a form of immunity from the law. Donald Trump felt that he could have his lawyer fix his indiscretions through physical harm and hush money to gain the silence of others, leaving him in the clear. This was done to help his campaign for president, running on a campaign who claimed (until today) that his opponent was crooked. The First Amendment is needed for small people or people who work for small organizations. Dershowitz further states that the raid will make people afraid to seek legal advice. I seriously doubt it. A good lawyer will be sure to take steps to ensure confidentiality by having a client sign a contract to represent them in a specific matter. The problem Trump has, is that he wanted Cohen to fix everything, and leave him in the clear. It likely made Cohen a partner in crime. Dershowitz goes on, to state this highly intrusive manner of collecting evidence, was done for political reasons. Again, this seems contrary to facts as there were reviews of this warrant in the Justice Department and the Southern District of New York. If a similar raid were conducted on Hillary Clinton’s office, it would have to go through the same court system. I would support this as well. I believe Michael Cohen subdued reaction is because he knows the FBI has a mountain of incriminating evidence against him. The role of Trump’s fixer came to an abrupt end, and now the fixer has some real negotiating to do with authorities instead of Trump’s occasional indiscretions. The late night comedians, such as Stephen Colbert and John Oliver, are having a tremendous amount of fun over the irony in all of this. Trump appointed an Attorney General, who has been as tough as nails on illegal immigration, drug use and against sentencing reforms. Yet, Trump is steadfastly trying to make himself an exception to the heightened law and order approach of the Justice Department. The last one isn’t really that meaningful, as there have been a lot of faster 5 week moves on a percentage basis. A belated congratulations to all those involved. Did Mexican border apprehensions soar? Details of Donald Trump’s decision to send National Guard to the Mexican border, have not been finalized. He needs further consultation with the governors of the states involved. His basis is that apprehensions are surging, as a result of increase attempts to illegal enter the US. Note CBP data combines both apprehensions and inadmissibles together and for convenience I call them apprehensions. 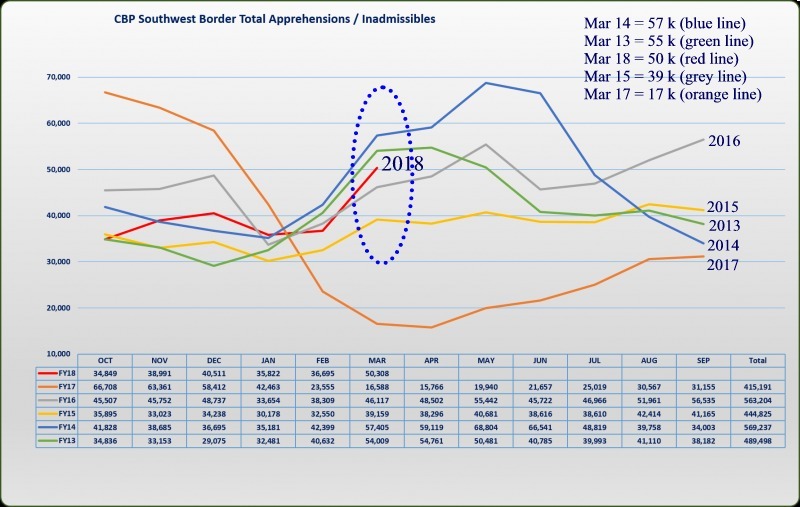 I conclude the apprehensions at the Southwest border to Mexico have not suddenly soared, after an examination of the Customs and Border Patrol data. In fact, apprehensions (approx 50,000) are very much in line with the prior five years. What was very unusual was the pattern in FY17 as shown in the orange line. The fiscal year 2017 goes from October 1, 2016 to Sep 30, 2017. So, October 2016, during the Obama administration had a record number of apprehensions (67,000, I’m rounding the numbers to multiples of 1,000), followed by a sharp drop off to a record low in April 2017. Exactly why the apprehensions in 2017 were abnormally low, maybe a combinations of a number of factors. Remember, these are immigrants who were either turned away at the border or caught attempting to get in. The most obvious factor could be the perception of tougher enforcement at the border by President Trump. But also remember when the economy of the US is doing well, this also tends to help Mexico and the other Latin American countries, so fewer immigrants attempt to cross the border. The Mexican coyotes control the border crossings, with a network of associates in Guatemala, Nicaragua, Honduras and other countries, and I believe they are charging very high fees (> $10,000) for their services, based on conversations I have had recently. It isn’t easy to interpret these statistics. The high number of apprehensions as occurred in June 2014 (68,000 apprehensions) might be the result of diligent efforts on the part of Customs officials, and not an increase in the number of illegal immigrants. In 3 of the 5 years, there is a significant drop off apprehensions from May to Jun (2013, 2014 and 2015), but 2017 is markedly different with an increasing trend extending from April to Dec 2017. Bottom line is these are the statistics of people who didn’t get into the US, and we don’t know how many did. Ok. This isn’t about the cost of guarding any actual fence or wall. I note that see through fence, rather than a solid wall has been long considered a more effective border security efforts. Some prototypes include see through sections, so are they walls or fences. Do we care? This is about the eight standing prototypes in San Diego. They must be guarded day and night against graffiti artists, who would love to deface them probably with not very favorable opinions of Trump’s immigration policies. The task to stand guard over these eight walls/fences falls to the San Diego city police and the San Diego County Sheriff’s office. NBC 7 local news in San Diego reports a total cost of around one million dollars, of which $278,000 is for city police and $761,000 is for the Sheriff’s office. The Sheriff’s office estimate is for approximately 10,000 hours of overtime, coming out to $76/hour. The cost estimate from NBC News is provided in the links. There has been no reported arrest of graffiti artists, so the security must be working. This also may be to the no nonsense Trump position (Minimum mandatory sentence to all graffitists) or the “Trump effect” of not daring to deface his wall. The prototypes have already been tested, I guess, by seeing if people can get over them. It has been reported that all the prototypes passed, even the ones with see through parts. If these prototypes are to stay until the security fence (the word I like) is built, we may be looking at decades of prototype protection. It would seem there should be some way to make money off of this. San Diego Prototype Park? Maybe do some landscaping, and build signs, explaining the features of each fence. Or, invite local artists to paint the walls. In Miami, we have Wynwood walls, which is very popular among tourists. I suspect like many walls, this one will come down. The destruction day should be on YouTube. And I expect Trump to stiff the city and county for all their good work. This report also goes into details of the drastic drop off of illegal immigrants entering the US through Mexico. But the Department of Homeland Security is saying that in March 2018, there was a sudden surge in attempted illegal entry. Of course, all we have are statistics on how many failed to get into the US, not how many evaded border patrols. There are a lot of statistics floating around, and I’ll do my best to explain them in a future blog.